Literary trivia: CS Lewis, Narnia and c.
CS Lewis and Tolkein were friends–very good friends–and had many of the same interests. But comparing their works is like comparing apples and wheat bread–they’re both food. That’s about where it stops. They’re both authors, who wrote books. The Tolkien was much more interested in the myth in mythology–creating a consistent, believable world from the ground up. It annoyed him that Lewis chose so many things from different mythological traditions. Lewis also wrote more broadly, shall we say. He wrote the Narnia books, he wrote the Space Trilogy, he wrote Till We Have Faces (which is so underrated, if you ask me), and of course he wrote apologetics. Tolkien? Yeah, not so much, or if he did, I certainly haven’t seen it or heard about it, and I’m pretty “up” on apologetics and Christian writing. This is not to demean his Hobbits and LOTR, because those are mammoth achievements. I’m saying that Tolkien wrote almost one thing, exclusively, while Lewis…didn’t. This isn’t a bad thing. But it’s not helpful to try and compare the two, just because they were friends. Nathaniel Hawthorne and Herman Melville were friends, and their books are not really alike, are they? Yes, they both deal with Christian themes, to an extent. That’s about it. 1752 others are also watching. This is big. REALLY big, huge. I wrote an entire novel, start to finish. I have never done that. I’ve been writing for a long time, but I have never finished a story. I’ve written an end and a beginning but left the middle to fall like a souffle. This month, I did it. 50K words, 25 days. Wow. It is true–your characters will do crazy things that you never expected them to do, when you’re writing. Conflict is key. When you take away a conflict, you have to create another one. Things that I thought were going to be important vanished entirely, and things I never thought about became important. Some characters appeared, some vanished, some came and went. This is, of course,only a draft. There are things I’m going to want to clean up and edit and make clearer, and places that definitely need some elucidation. But I wrote a novel, with a beginning, a middle, and an end. And I am really happy about that. Happy belated Thanksgiving to all of you! 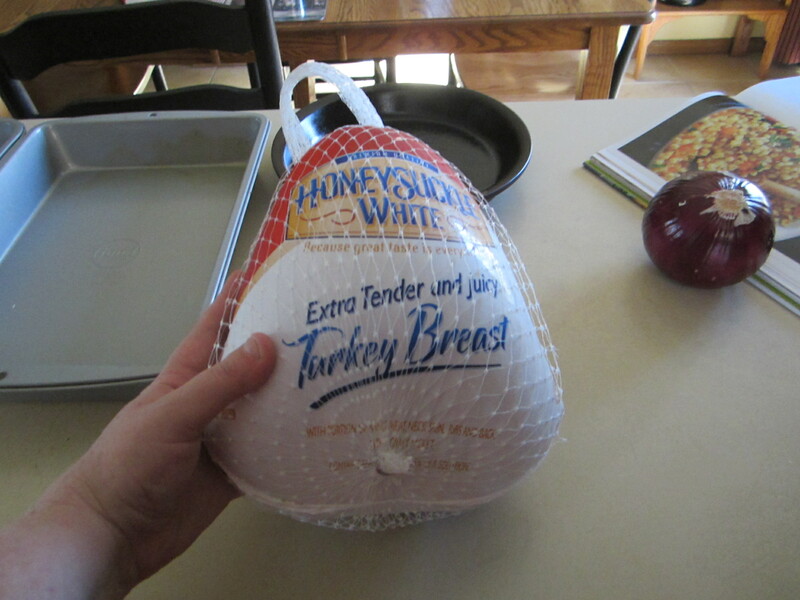 This month’s big adventure–so far–was Making The Turkey. 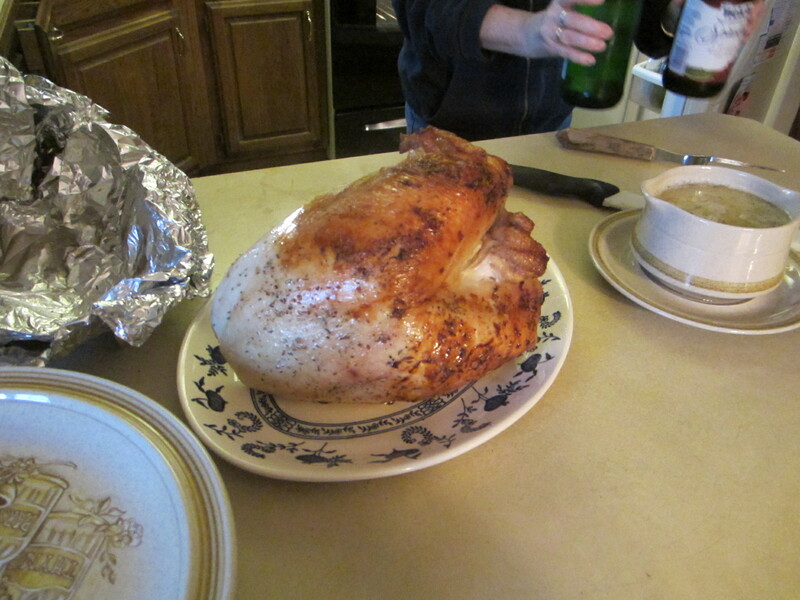 Now this wasn’t a whole turkey–it was just the five of us for Turkey Day. So I made a turkey breast–6 lbs. I had been lusting over a recipe for Turkey breast with rosemary, leeks and apples in a Pampered Chef cookbook since I was a teenager, so getting to make it was a culinary dream come true. The store didn’t have leeks so we made do with onions. 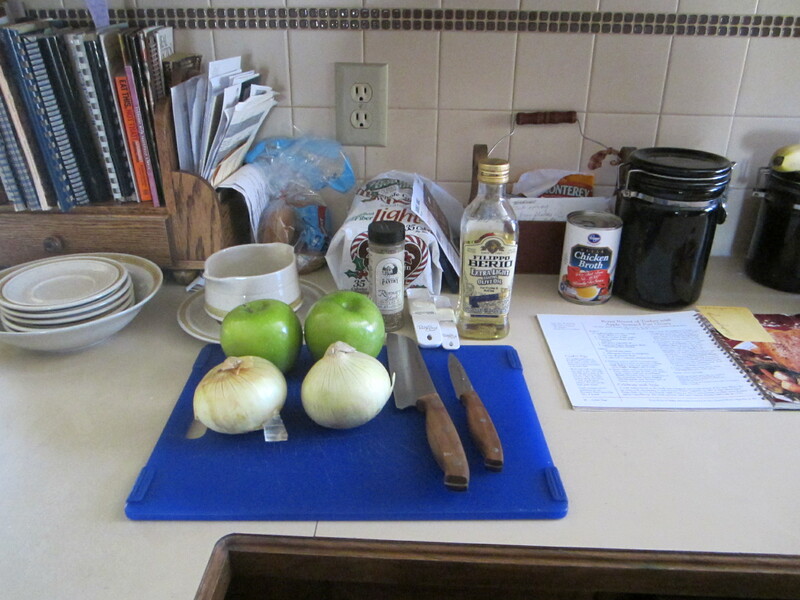 You slice the onions and apples into rings and place them at the bottom of the roasting pan. Set the turkey ontop. Brush the turkey with olive oil, then sprinkle dried rosemary over the bird. Roast in a 350 degree oven for 1 hr 50 minutes to 2 hrs 20 minutes. I think we went a bit longer than that, but it was delicious and juicy and the skin, holy jiminy. The skin was incredible. This adorable babe, who is a little over a month old. I’ve known her dad since the first day of high school–we were in French I together–so, 16 years. I was in his wedding and am also good friends with his wife, who is a medical genius (she’s going to be an OB). 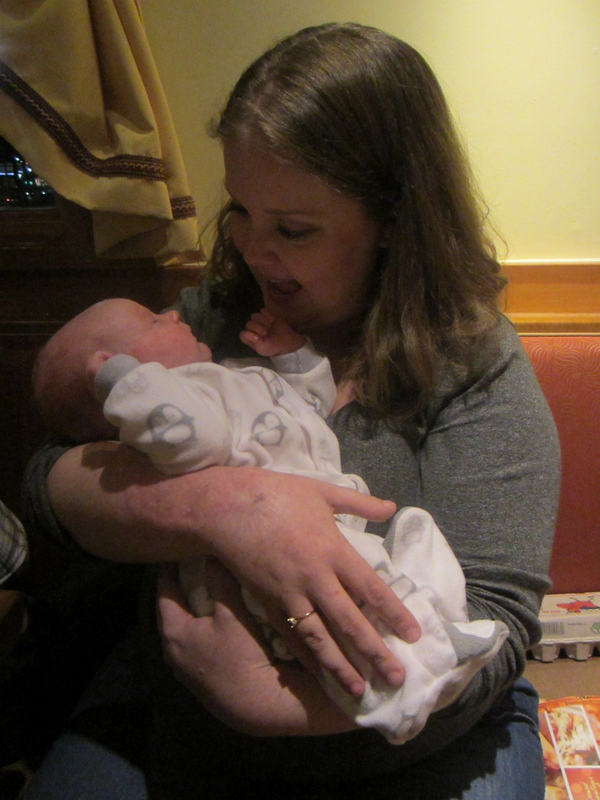 This is their first kid and she’s precious! It’s amazing and baffling to think that the people I met back in high school are still my friends, and are getting married and having babies. Wow. But the kids are truly adorable and a lot of fun. 670 others are also watching. Well there was 31 days of lit! 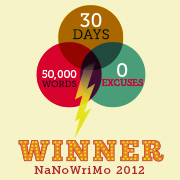 I know, I’ve sort of abandoned you–blame NaMoWriMo! Speaking of that, I am on track to get this novel done. So far I’ve written 20,115 words. Some of them I want to scrip right now, and some of them are good. But I am suppressing my inner editor until Dec. 1! I started a new job last week. Never thought that would happen. I’m still in the Senate but I’m in a different office. With session starting this week, we’ll see how different (or not) things are! I’m enjoying it thus far. I have a bigger space, and the people I work with are great. 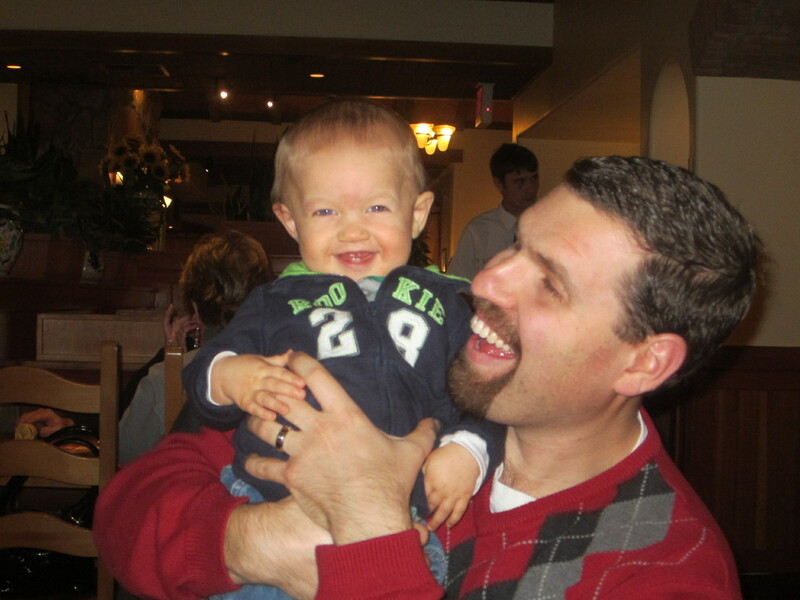 I wrote this over at CPG, my Catholic stuff blog. If you’re into that sort of stuff, read it and then comment. Thanksgiving is soon upon us! I’m helping my mom with the meal this year so I’m excited about it. I’m trying to teach myself music theory. I found a textbook at Half Price Books, in beautiful condition, for $7. So we’ll see how far I get. The whole math and music thing never really clicked for me. I am awful at math. I am good at music. We’ll see how I am at music theory!